Today I bought a cat! It’s a girl. Within fifteen minutes I became immediately at risk of turning into one of those guys who dedicates an entire blog to their cat and obsessively photographs its every misdeed. 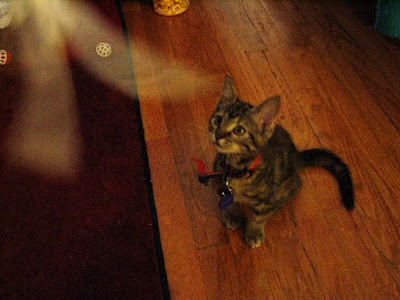 Most people do this under some misguided notion that their feline is the cutest or the most mischievous or the most curious or the most energetic, etc. I laugh, for unbeknownst to them I have acquired the real cutest, most mischievous, most curious and most energetic kitty. However, their benevolent delusions are perhaps a blessing, since it will prevent them from busting into my home and taking my precious kitty. Currently my girlfriend and I have yet to name her. She has a beautiful mottled coat of several colors and can jump super high and often. It purrs (at the slightest touch) like a motorcycle gang at a red light. For the last twenty minutes it has been exploring the house starting with the areas where it could cause the most trouble and frolicking outward. She loves toys and has already nearly devoured one. There will be future updates and more pictures, but I will try to keep it under restraint. I’ve been trying to photograph it for the past half hour but it doesn’t stop moving long enough not to blur the shot. CAT! Pity it isn't fat. I'm sure that will change. Promise me you will not put grammatically incorrect text over the pictures in order to make a lolcat picture. I can has bad grammar. Youse no find humor in catz playin with invisible... oh I give up. This isn't funny. But that cat is great. We named her Kinski (after Klaus and Natassja Kinski). Our hamster is also named after a German actor, Bruno Ganz. Kinski is adorable and meows plantively if I even leave the room (she won't come over to me, I have to come rescue her). It slept on me three times today and licks me on the lips (distressing Katie greatly). It also made about fifty separate attempts at stealing my lasagna and when I gave up in exasperation and let it have a bit, it decided better of it. "But that cat is great. We named her Kinski (after Klaus and Natassja Kinski). Our hamster is also named after a German actor, Bruno Ganz." That's so Raven. I mean, Brian. That's one badass cat. I'm excited you're finally a man. The line between man and boy is getting a cat, right? Thought so! Congrats and make sure Bruno doesn't use any of its ninja kill moves on it. Claws Kinski it is. Very clever. Katie's parents came over to play with it today and had great fun. We got a new hamster ball for Bruno and now the two are pretty evenly matched. They keep each other entertained and exercised. I kind of want to make I CAN HAZ NAUGHTINESS type pictures. Especially when certain kitties wake me up and are persistently hyper at 5 a.m. DARN YOU, KITTY, TODAY WAS BID DAY! We definitely have to put up pictures of her batting around Bruno in the ball. 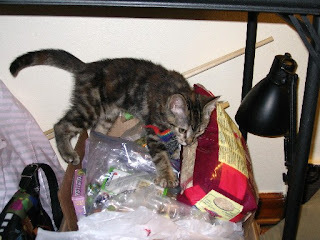 In retrospect, our kitty IS the most mischevious! Also, when I post all the tons of nonsense pictures of her partaking in naughtiness, I will have to direct all these kind folks that way.